Comic Book Mania Convention, Gail Borden Public Library, 270 N. Grove Avenue, Elgin, IL, September 29, 2018. Hours: 10am-5pm; admission is FREE. Would you like Solution Squad to have a presence at your comics or educator event? Please include the name, dates, and location of the event. Generally, the more information about what it is and what you are looking for, the better! Jim is an engaging public speaker regardless of the age of the audience. He reaches his audience on their level, no matter what the level is. Chicago Comics & Entertainment Expo, Chicago, Illinois, April 26-28, 2013. 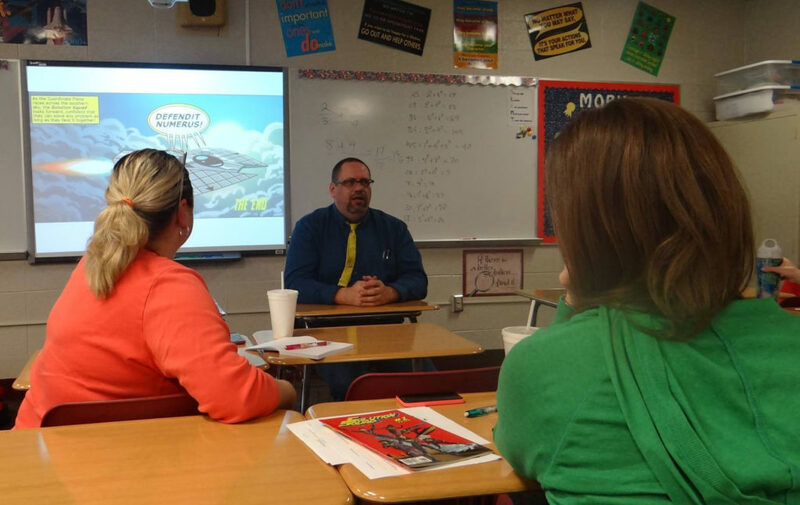 Jim participated on a panel called Integrating Comics into the Common Core on Friday, from 12:45-1:45 PM. Comic Book Mania Convention, Gail Borden Public Library, 270 N. Grove Avenue, Elgin, IL, July 13, 2013. Hours: 10am-5pm; admission is FREE. New York Comic Con, Javits Center, New York, NY, October 9-12, 2014. Jim presented on two panels. American Library Association MidWinter Conference, Sunday, February 1, 2015. 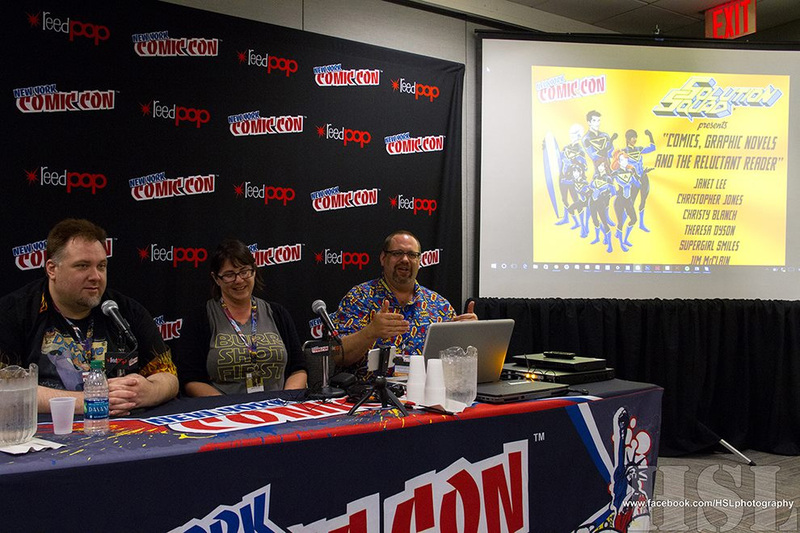 Session: Making Educational Comics: Why Should the Pros Have All the Fun? Comic Book Mania Convention, Gail Borden Public Library, 270 N. Grove Avenue, Elgin, IL, July 16, 2016. Hours: 10am-5pm; admission is FREE. Comic-Con International, San Diego, California, July 20-24. 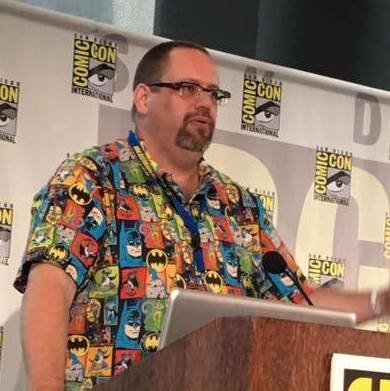 Jim will participate in two panels, Teaching STEM with Comics and Solution Squad: Teaching Math through Comics, both on Saturday, July 23, from 1-3 PM. New York Comic Con, New York, NY, October 6-9, 2016. Jim presented on two panels, Using Comics and Graphic Novels to Teach STEM, and Using Comics and Graphic Novels to Engage the Reluctant Reader. Indiana Comic Con, Indianapolis, Indiana, April 14-16, 2017. Jim will be presenting all three days. Chicago Comics & Entertainment Expo, Chicago, Illinois, April 21-23, 2017. Jim will participate on several panels. U93 Roofsit, Heritage Square Martin’s, Granger, Indiana, June 22, 2017, 5:00 PM-8:30 PM. Comic Book Mania Convention, Gail Borden Public Library, 270 N. Grove Avenue, Elgin, IL, July 15, 2017. Hours: 10am-5pm; admission is FREE. Solution Squad Signing and Educator Workshop, Aw Yeah Comics, Muncie, Indiana, July 19, 2017 3 PM-6 PM. Purdue University Seminar/Imagination Station appearance, West Lafayette, Indiana, October 13-14, 2017. Jim will be presenting to engineering and math education students as well as children at the Imagination Station. Indiana Council of Teachers of Mathematics Fall Conference, Indiana Marriott East Hotel, Indianapolis, Indiana, November 5-6, 2017. Jim will be presenting. 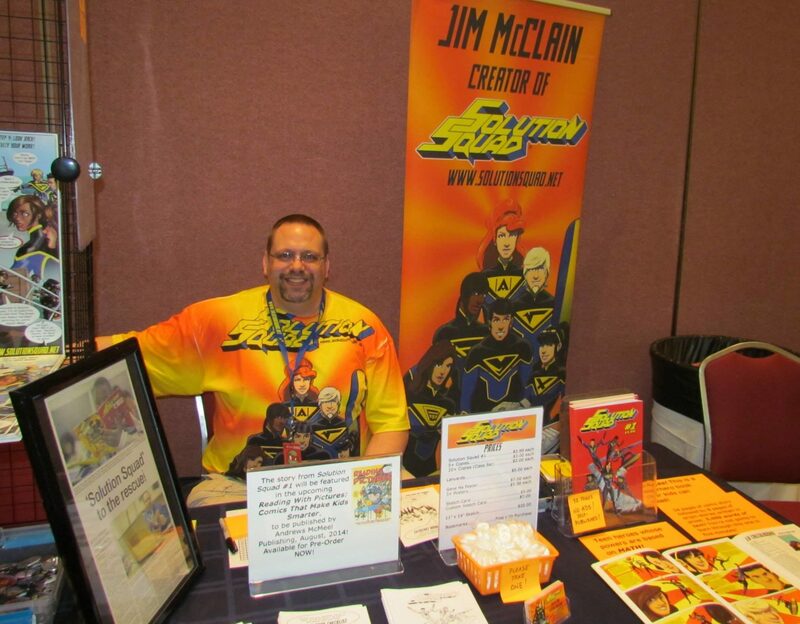 Chicago Comics & Entertainment Expo, Chicago, Illinois, April 6-8, 2018 Jim will participate on several panels and appear in Artist Alley.